The ultimate objective is to close materials loops on a global level across all stakeholders, industries and geographies [Figure 23]. To get the full arbitrage of closing the loops, materials flows that are smooth and pure will be established by effecting concerted change along the entire supply cycle and across industries. This streamlining will ideally go all the way back to the roots—basic materials. PET offers a useful analogy: high adoption of PET as the basic input for bottles across the beverage industry has created a substantial market for recycled PET, even beyond bottles. This in turn has created a stable platform for further materials innovation (see Box 4). While this is not by any means a perfect flow (a large proportion of end-of-use PET still ends up in downcycling cascades or landfills/incinerators), it shares a number of attributes that contribute to establishing a pure materials flow. The first polyethylene terephthalate—better known as ‘PET’—bottle was introduced in 1973.102 It quickly gained wide acceptance among bottlers and consumers because it is lightweight, economical and shatterproof. Today, it is estimated that around 40% of all soft drinks packaging around the world is made from PET. It is also used as a packaging material for many other consumer products, not just beverages. By creating a de-facto standard for plastic bottles based on PET, which is 100% recyclable, an entire system has been organized around maintaining it as a technical nutrient across multiple cycles without quality degradation. PET collection rates vary across different regions in the world. Regions with relatively high collection rates include Europe, with rates as high as 48%, and Brazil at around 55%. Recycling drives value by replacing a share of virgin raw materials (around 20 to 30% of plastic bottles use rPET, for example). It also generates additional revenue streams, as rPET fibres can be used for secondary applications (such as textile manufacturing). This secondary materials stream offers an attractive business case with high volumes and value, too, so a market has also formed for rPET. This has attracted investors to install recycling technology (e.g. Closed Loop Recycling) and collection schemes that create business opportunities for solution providers along the reverse chain. Tomra reverse vending machines are one of the core components of the dual system in Germany, for instance. Because the much of the PET usage is single use, the industry is conscious of public demand for sustainability and recycling. As such, recycling has been high on the agenda of bottlers and consumers since the early days. As April Crow, Global Director of Sustainable Packaging at The Coca-Cola Company, points out, “We [as a consumer goods community] need to make sure that more of the materials we put onto the market have value to encourage the circular economy approach; too many today are difficult to recycle or contaminate existing recycling streams. When we introduced the first PET bottle into the market in the late 1970s, we made a commitment to develop the technology that would allow that material to go back into our packages as a secondary raw material. We supported the development of the technology and end markets to enable this.” Coca Cola has a design approach that insists that their packaging must be designed to be recyclable. However, the company also recognise there is still a role to play in increasing collection and recycling of the packaging material that they produce. Meanwhile, innovations have increased PET applications. One of the most visible is the significant reduction in bottle weight and wall thickness. Nestlé Water, for example, continuously reduced their total PET packaging weight from 2005 to 2010. By 2010, they were using an average of 41.7 grams of packaging materials per litre—19% less than in 2005—by making the bottle, caps and labels lighter without compromising quality (covering properties such as resistance during transport, solidity, permeability and softness). It is now even possible to fill PET bottles at elevated temperatures due to innovations in bottle shape, opening them up for new markets, such as sports drinks. 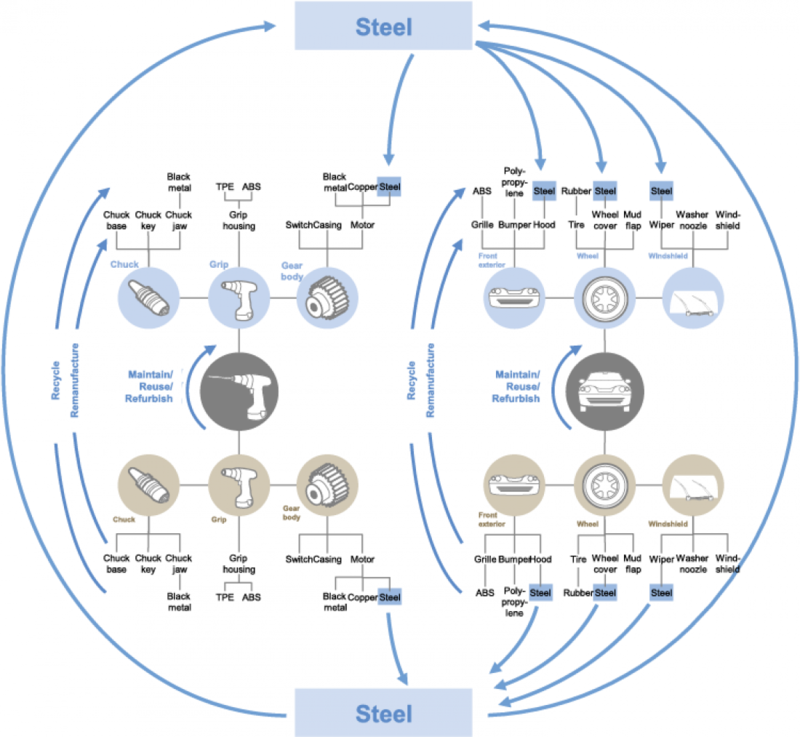 Unlocking the full potential of the circular economy for basic materials thus means reorganizing and streamlining materials into global flows and loops of standardized purity. An initial step will be to pick and reorganize a few materials streams that are already sizeable and well understood in terms of properties, economics and (emerging) treatment/processing technologies. These would be materials where a concerted effort by a few major players can create markets large enough to surpass the threshold value for circular arbitrage models. Some traditional materials are prime candidates. Analysing current municipal solid waste composition reveals that the most abundant discarded industrial materials include paper and cardboard, plastics, glass and metals. Their potential is enormous. Strikingly, although metals are already perceived to have high collection rates, a recent UNEP study of 60 common metals has shown that only one-third actually have a global end-of-use recycling rate of 25% or more.103 In addition to traditional basic materials, it will also be important to plan global circular scale-ups for emerging or still largely unfamiliar materials. 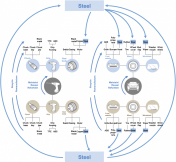 This means setting up systems for materials that will be used in manufacturing processes of the future (e.g. 3D printing), and that are restorative by choice, even if their volumes are low today. Golden Oldies. These are well-established, high-volume recylates with a remaining purity challenge. 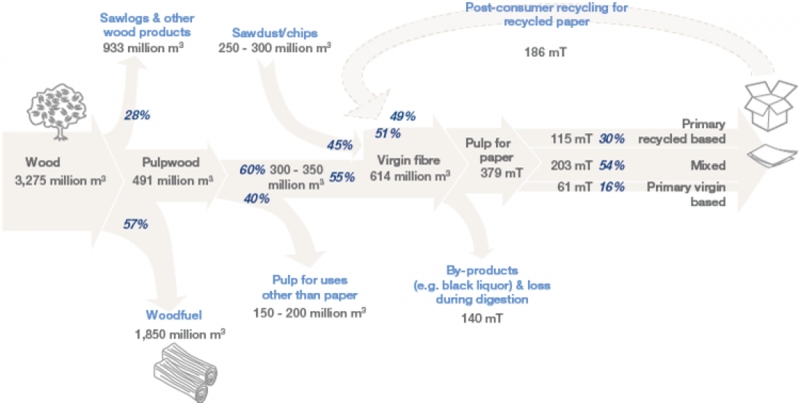 Paper and cardboard as a high-volume materials stream has high collection rates, but suffers from quality loss and ink contamination during the reverse cycle, resulting in an estimated US$ 32 billion in value lost annually. PET, glass, and steel also fall into this category. High Potentials. Materials used in high volumes that currently lack systematic reuse solutions are polymers, for example. Collection rates are limited, and separating out the materials/maintaining their quality and purity is hard due to the high fragmentation of materials, supply chains and treatment technologies. Rough Diamonds. These are large-volume by-products of many manufacturing processes, such as carbon dioxide and food waste, A broad set of valorization technologies is emerging that could provide additional value and displace virgin materials intake. Future Blockbusters. A number of innovative materials have breakthrough potential, either from enabling substantial improvement of materials productivity (such as 3D printing), or having usage cycles that are fully restorative by design and intention. Because the position at the outset is different for each type of material, and each category comprises a large set of materials, a first step would be to pick a signature material from each category as an example. Different players will then find it easier to collaborate on specific materials across industries and geographies. The findings that result at a systems level will often be highly transferable to other materials in the same category. After establishing proof of concept and initial flagship successes for these signature products, the stakeholders can then roll out the solutions to other materials in a given category. This will be much faster than if they tried to cover all the materials in a category at once. A detailed map of current flows is the first milestone, identifying and quantifying materials leakages at the ‘pain points’ for each material. The next would be developing targeted initiatives to address these leakage points, putting solutions in place (at a systems level) to capture the value quickly. These sets of initiatives would ideally create large, pure and constant materials streams that are economically attractive, catalysing global liquid markets for their reverse cycle networks. Experts around the globe were interviewed for this report, providing unique insights into the potential of circular flows in each of these groupings. Paper and cardboard is an excellent candidate for a signature material in the ‘Golden Oldies’ category. It is already collected in large quantities, traded globally and recycled using well-established technologies (with a global recovery rate of 49% and up to 78% in Japan—Figure 25). The challenge in paper recycling is minimizing the loss of fibre and fibre quality during processing. One aim of the initiative would be to minimize the inflow of pollutants into the materials stream. Another would be to exchange best practice on how to maintain the desired properties over multiple recycling loops (or at least to identify options for maintaining the highest use form in the downcycling cascade). Polymers represent a signature product in the High Potentials category. Many companies—including Philips, Electrolux and B&Q/Kingfisher—have initiated internal projects to streamline the amount of polymers they use. They are also enforcing compliance with increasingly stringent regulations, including the EU REACH programme and the US EPA’s Toxic Substances Control Act. Other aims are to standardize and simplify components and materials, limit the additives and compounds required to achieve the desired materials functionality, and raise collection rates. A further aspiration is to invest in advanced recycling technology. Some companies are already well ahead on this path. Alongside their mission to increase recyclable content across their portfolio, Electrolux and Philips have drawn up lists of restricted materials not to be used in their products.104 B&Q/Kingfisher is striving to create their first closed-loop product, starting with their signature power drill. They are exploring with their drill manufacturer in China and MBA Polymers how they might start to build in circularity right from the product design stage, use recycled plastics, and establish a reverse cycle to collect and extract the materials in a closed-loop system. 105 The drills could be manufactured in China according to circular economy specifications and with recycled materials from their own feedstock. After being sold in Europe, they could be collected for refurbishment in Europe and recycling in China. These case examples highlight the importance of reducing toxicity in the materials selected and how they are designed. In addition to refurbishment, remanufacturing and up- or downcycling them after end-of-use, collaborating with partners in the reverse cycle networks is also key. Of the four major polymers used in today’s industrial applications, polypropylene (PP) could be the ideal candidate as it is consumed in high volumes (50 million tonnes in 2010) across many products, including electrical and electronic equipment, automotive parts, packaging and textiles. The first three product applications have relatively high collection rates, and a large amount of PP could be extracted. Technologies for separating and identifying the different variations of PP would need refining. But the largest opportunity of all would be to simplify and improve recyclability of the wide range of additives currently used in polymer manufacturing. Additive choice today is driven by cost and functionality, not by recycling feasibility. The latter corresponds to the strength of the bonds these additives form with the polymers. Additives that are mixed with the polymers mechanically rather than being chemically bonded are easier to separate. Examples are inorganic pigments such as titanium dioxide (a whitening pigment) and iron oxides (red, black, brown and yellow pigments).106 An opportunity would be to tackle PP applications where technology requirements are low. These would include packaging and the use of non-differentiated components to simplify and/or increase the use of mechanically mixed additives. Carbon dioxide recovery could be a signature material for the Rough Diamonds group. McKinsey & Company has established an initial carbon cost curve for carbon recovery (especially in the form of CO2) that maps the carbon emissions abatement potential for existing technologies along arbitrage opportunities. This sphere has only gained niche attention so far (greenhouse products and oil recovery, for example), but a number of promising technologies exist and many more are emerging that can capture and metabolize of carbon as an industrial by-product. Many of those would be profitable even without carbon pricing [Figure 26]. Currently, only 16% of the 500 million tonnes of low-cost, concentrated CO2 are tapped in this way. (This is primarily CO2 available from natural sources, as a by-product of fertilizer plants that process natural gas, at a cost of less than US$ 20 per tCO2). However, now Novomer in the US and Bayer in Germany have started pilot plants to transform CO2 into commonly used polymers, including PE, PP, and polyurethane. This opens up the possibility of eventually replacing oil as the feedstock for these materials – a huge opportunity. Commercialization of the technology is expected by as early as 2015.107 Advances in this area would overturn the concept of CO2 as a pollutant, instead exploring how it could become a valuable economic asset for other businesses, serving as a feedstock for polymers and other materials currently dependent on oil. Through the lens of circularity, the economic justification Carbon Capture and Storage (CCS) Projects, arguably a key technology we still require at scale to address CO2 pollution from new coal power stations, can be transformed. 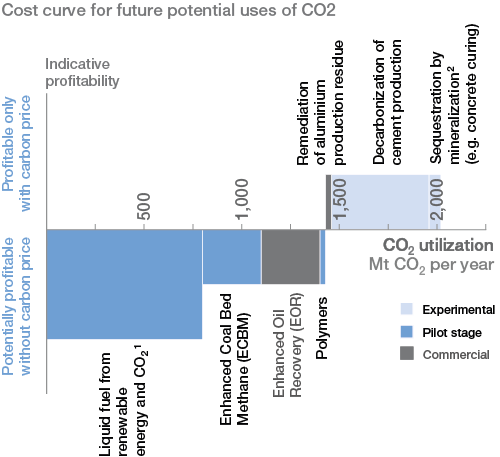 CCUS projects (Carbon Capture, Use, and – if needed – Storage) become driven by the economics of the revenue stream generated by the potential use of the CO2 in new industrial applications. The economic potential of CCU projects would be worth analyzing in this project, especially for non OECD economies. The central question would be how these technological inventions can be used to innovate the business models around them at systems levels. Large-scale energy producers with chemical feedstock companies would ideally join forces in converting their CO2 into polymer-based products. Perhaps they could even be encouraged to find uptake for them in their own markets. The objective of a concerted effort focused on 3D printing would be to gain an overview of the materials currently in use. Which have the highest potential for integration into circular economy systems, at the lowest cost? 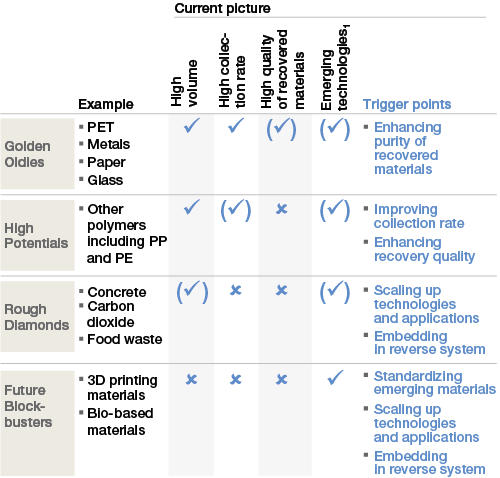 The rapidly evolving materials landscape could be screened and potentially guided towards more reusable materials—potentially even those that are fully bio-based and regenerative. A take-back system would also be needed to ensure that products are returned and reconfigured as feedstock. 3D printing operates in an additive rather than subtractive manner. The printer generates the product and minimal support structures, greatly reducing the amount of materials used and the energy required to manufacture the product. The logistics of building to shape in this way (‘additive manufacturing’) are also much less energy intensive, as manufacturing using 3D printing involves sending data around the world via the Internet rather than physical materials around the globe on trucks, ships and planes. According to the US Department of Energy, additive manufacturing uses 50% less energy on average, and saves up to 90% on materials costs compared to traditional manufacturing.110 The technology can also create objects that are difficult or impossible to produce via traditional techniques. These features explain why 3D printing is likely to spread so rapidly over the coming decade. Its use is already commonplace for designers and engineers, who use 3D printers to create product prototypes, tools, moulds, and even final products. On an industrial scale, Boeing has produced over 20,000 3D-printed parts since last year, using these parts in 10 different types of military and commercial aircraft.111 These newer applications of 3D printing could enable unprecedented levels of mass customization, while at the same time transforming supply chains into efficient and sustainable models. Another Future Blockbuster: bio-based, regenerative materials. By applying bio-based and regenerative materials at scale, Lend Lease improved the process for enhancing the use of certified regenerative materials (such as new wood) in the construction of London’s Olympic Village. Scaffolding used for construction was later folded into the furnishing and finishing of the buildings, and is now part of the surrounding landscape design after dismantling the temporary houses. This represents an effort to maximize the use of materials for lasting infrastructure construction, resulting in significant materials savings and reduction of construction waste (no wood transported to the site went unused or wasted).114 Regenerative materials that are restorative by nature/design could replace more complex materials that are harder to reuse in large and materials-intensive applications. Bio-based materials could also be generated using by-products from other processes as feedstocks, as the following examples show. Lend Lease’s new product line, Cross Laminated Timber (CLT), is made from wood chips of short and medium length from wood mills (normally considered scrap). Their proprietary technology presses the chips into timber boards. Construction using this material is fast, and also requires less labour, energy and water. The first 10-storey apartment building using CLT took a team of five skilled workers just 10 weeks to construct. Ecovative produces highly versatile and completely compostable alternatives to synthetic materials. Their products are made of mycelium—the roots of mushrooms—that grows in and around agricultural by-products. Mycelium can assume any shape at all. These materials are already being used in protective packaging for Steelcase and Dell, as well as new sustainable packaging in collaboration with Sealed Air. Ecovative is expanding the applications of their innovative material from packaging to home insulation, cars and structural biocomposites.115 In the words of Sam Harrington, Ecovative’s Marketing, Sales & LCA Director: “you can pretty much grow anything with mycelium.” Its applications are close to unlimited. As with 3D printing materials, the first step is to gain an overview of the current bio-based materials landscape. This will spotlight companies with the greatest potential for large-scale cross-industry applications. Bio-based materials will ideally tap the waste feedstock from other value streams (e.g. agricultural waste, and manufacturing by-products such as wood chips). Driving standards and encouraging investments in the R&D of these materials will also speed their development. In addition, a thorough investigation of the implications of scaling up these systems would be needed to avoid the unintended consequences of resource depletion. For example, the EU policy of subsidizing biomass for biofuel led to shortage of wood in Europe and un-sustainable imports of wood from other countries to fill the gap. It also negatively impacted e.g. the furniture industry by mispricing a valuable resource. Initiatives on purifying materials stocks should include establishing the building blocks and mechanisms to facilitate smooth materials flows. Further detail on how this is planned can be found both in Chapter 5. 102 Plastics Recyclers Europe. Husky Injection Molding Systems: Quantifying Environmental Impacts of Carbonated Soft Drink (CSD) Packaging, 2009. CEMPRE. Interview with Claus Conzelmann, Vice President, Head of Safety, Health & Environmental Sustainability at Nestle; Interview with April Crow, Global Sustainable Packaging Manager at CocaCola; Nestle Waters (http://www.nestle-waters.com/environment/bottled-water-recycling/pet-bottled-water-usa-europe). Expert interviews. Other public resources. McKinsey analysis. 103 UNEP International Resource Panel Recycling Rates of Metals—A Status Report, 2011, United Nationas Environment Programme (UNEP). 104 Interview with Robert Metzke, Senior Director EcoVision Program at Philips, and Emile Cornelissen, Head of Supplier Sustainability and New Venture Integration Manager of Philips Group Purchasing. Interviews at Electrolux with Karl Edsjö, Project Manager, Environmental & European Affairs, as well as Monica Celotto, Project Leader, and Daniele Gallo, Materials Engineer, both from the Global Technology Center. 105 Interviews with James Walker, Head of Innovation at Kingfisher (B&Q). 109 Disruptive Technologies: Advances that will Transform Life, Business, and the Global economy; May 2013, McKinsey Global Institute. 110 Interview with Janine Benyus, Co-Founder of Biomimicry 3.8 Institute, and Beth Rattner, Interim Executive Director of Biomimicry 3.8 Institute. 111 Dickey, M.R., Hope You Trust 3D Printers—Boeing Uses Them To ‘Print’ Parts For Its Planes, Business Insider, 21 June 2013 (http://www.businessinsider.com/boeing-uses-3d-printers-for-airplane-parts-2013-6). 112 Interview with Douglas Mulhall, representative of the Academic Chair, Cradle to Cradle for Innovation and Quality Rotterdam School of Management, Erasmus University, as well as EPEA Internationale Umweltforschung. 113 Janine Benyus recorded presentation in Ellen MacArthur Foundation CE100 library. 114 Interview with David Nieh, Head of China at Lend Lease. 115 Interview with Sam Harrington, Marketing, Sales & LCA at Ecovative Design.